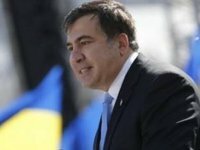 Former Georgian President Mikheil Saakashvili has said that he decided to resign from his post as head of the Odesa Regional State Administration. "In this situation, I decided to resign and start a new stage of the struggle," he said at a briefing in Odesa on Monday. Saakashvili said that the last straw for him was the electronic declarations of officials, in which deputies and officials declared their millions and asked for financial assistance. He also said that the president of Ukraine Petro Poroshenko personally supports corrupt clans in Odesa region. He alleged that Ukrainian President Petro Poroshenko personally supports corruption clans in the Odesa region and the young officials who came to the administration recently and started working in a new way "not only do not get protection, but are absolutely defenseless because the supreme administration in Kyiv is directly setting all kinds of Presmans [parliamentarian Oleksandr Presman, Revival faction of the Ukrainian parliament], Goncharenkos [parliamentarian Oleksiy Honcharenko, Petro Poroshenko bloc faction] on them." "The president really personally supports two clans in the Odesa region: a gangster, criminal clan, [composed of] murderers from the 1990s [led by Odesa Mayor Hennadiy Trukhanov] and the 'Ismail' corruption [clan led by Odesa regional council chairman Anatoliy] Urbansky, the entire power in the region is in the hands of these two, and their separatist allies from [political party] Nash Kray and [Nash Kray co-chairman] Anton Kyse," he said. Saakashvili said he had promised the people of the Odesa region not to leave them to the arbitrariness of corrupt officials and therefore intends to fight together with "young people, unstained forces." "We will definitely unite and we will fight for the victory of new Ukraine for the people of Odesa, for all other residents of Ukraine. The fight continues, and we will definitely win this fight," Saakashvili said. Giorgy Lordkipanidze, the head of the Main Department of the Ukrainian National Police in the Odesa region, reported the resignation earlier on Monday. David Sakvarelidze, who earlier filed his resignation from the post of deputy prosecutor general of Ukraine, said he intends to create a new party called 'Khvylia'. Besides Sakvarelidze, the initiative group on the creation of the new party comprises former deputy prosecutor general Viktor Kasko, parliamentarians Viktor Chumak and Natalia Novak, and Volodymyr Kozlenko, chairman of the all-Ukrainian civil platform Nova Krayina (New Country).